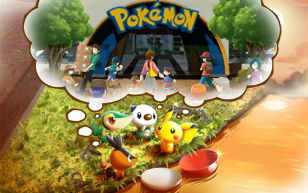 Pokémon Rumble is now out in Japan and as such further game details are coming to light. 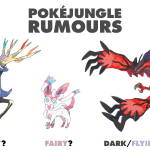 We’re cataloguing anything of interest below, with thanks to Serebii for running through the game. this post will be updated frequently so be sure to check back if you’re interested in this game! The game can be played using the Wii U’s off TV function using the GamePad. It’s almost like have a portable version of the game. Sort of. Points are awarded at the end of battles. The amount of points given is dependent on you performance during the battles. Special capsules are awarded if all the challenges in a battle are complete. The Pokémon inside is a rare one. For example a Blastoise. Capsules are awarded for defeating Pokémon. Red capsules give regular Pokémon, Yellow contain Pokémon with abilities. Blue capsules are also awarded but their contents are unknown. After defeating certain Pokémon you are allowed to progress to the next area: Defeating Chandelure allows you to move on to a park area. Celebi is found in this area, defeating Celebi means you can go to a train station. Here, Rayquaza is found, defeating it allows you to progress and meet Meloetta, who tells you about the Pokémon Shop. Meloetta challenges you, after you defeat her (in both formes) you are able to visit the Pokémon Shop. The Shop is home to Kyurem. Once you defeat Kyruem everyone returns to the toy shop and the main story is completed.